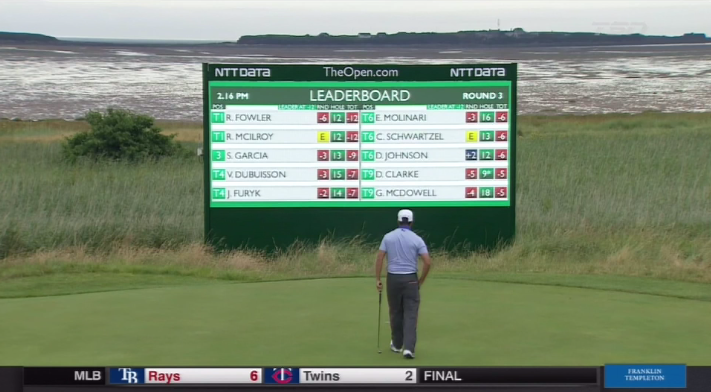 As Rory McIlroy looks to extend his four-shot lead on the weekend, I’ll be creating and uploading GIFs to this page. Look at the difference in ball flight on the third for Sergio from Friday to Saturday. Cool look at the tracer from behind with Ryan Moore. Charl Schwartzel goes 70 yards left from the tee. Club drop from Oosthuizen after going way right. Fowler drops the long bomb on 11 to get within one of Rory. Sergio misses the short one for birdie on 12. Tough for Rickie to not see where he stands here. Rory goes up by five after the eagle on 16. Sergio gives Rory a hug after the round.